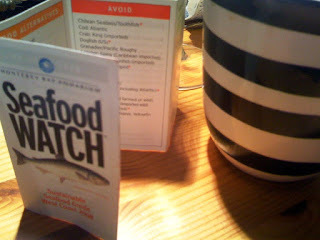 At the Monterey Bay Aquarium a couple of years ago, I picked up a slew of Seafood Watch cards. I gave them out to everyone in the family and have been carrying one in my wallet ever since. Not that I order that much seafood in restaurants. These days we hardly eat out at all. 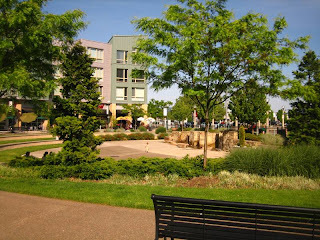 I remember having sushi once last summer at Mio Sushi at The Round in Portland, it’s a favorite spot that reminds me of being in Europe. In January I ordered smoked salmon pasta at Christopher’s in Coupeville, but that was our anniversary and I wasn’t focused on where my fish came from. I knew it was from relatively nearby, but wild or farmed, I forgot to check. Then there’s Ivar’s Fish Bar, where I occasionally grab a quick meal while waiting for the ferry. Occasionally – like twice a year. According to Ivar’s School of Fish, the fish and chips are made with Alaskan True Cod, which they claim as sustainable. Alaskan Cod is mentioned under Pacific Cod on Seafood Watch, but there are three listings – Best Choice, Good Alternative and Avoid. So you really have to read the fine print – Alaska caught makes the cut at Best Choice. Sigh of relief! As for seafood at home, it’s almost exclusively caught by us or someone we know. Our clams and mussels come from our own beach. A fisherman friend gives us an extra salmon. A local professional crabber is a long time friend (heck, I babysat him when he was six years old.) From time to time, usually when company is coming, we stop at his stand beside the highway for a lovely big Dungeness. All this is leading somewhere … Just found a new-to-me food blog to immerse myself in, Seattle Tall Poppy, where the subjects seafood and telephone linked up back in August through a post about sustainable sushi. As I only got my iPhone in August and have been very slow exploring the app store – very slow as I find it painful to use – I would not have found the Seafood Watch app on my own, but it’s a tool I’ll use next time I’m dining out. Thanks Tall Poppy.